TJ’s Radiant Heat, also knows as TJ’s Plumbing and Heating, Inc. has been in business for over thirty years; providing one-stop shopping for all of our customers’ mechanical needs, in the Boston area, and throughout New England. We are an industry leader in the design, installation and service of radiant heat technology, geothermal, solar thermal, air conditioning, snow melting, plumbing, residential and commercial boilers, and controls. We provide every customer with personal service, the highest quality material and workmanship and we offer annual service agreements to help protect our customers’ investments and keep their equipment functioning at its highest efficiency. By continually educating our staff, we stay on the cutting edge of technology in today’s ever-changing market. With the variety of options available in the market and the variety of programmable controls on the market today designed to increase efficiency, it is imperative that your heating and cooling systems are installed and serviced by an honest, reputable company who understands the latest technology. 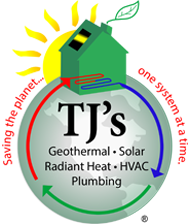 TJ’s Plumbing and Heating, Inc. is THE company that can provide you with personal service, technical know-how and years of experience. Our focus has always been, and will continue to be, educating our customers so they understand all of their options, allowing them to make the best decision for their home or business – and one that fits into their budget. We work with many quality manufacturers to ensure the best selection of options for each specific application. Experience the difference of working with a knowledgeable, professional contractor. CONTACT US TODAY!